I still have to pinch myself when I look through the window at the magnificent landscape of the Alps. 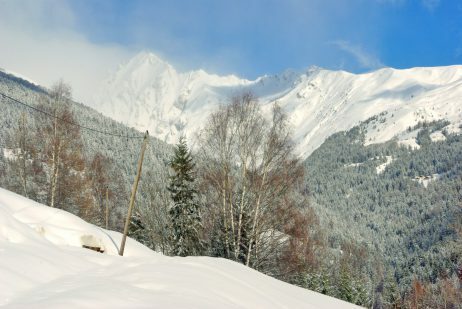 Snow-capped mountains towering the luxurious Tarentaise Valley. The smells of pine trees and the sound of cow bells in the distance. The tasteful beaufort cheese and other delicious local produce. Cross-country skiing in the Winter and amazing hikes in the Beaufort massif. Welcome to Granier-sur-Aime, our home base since February 2018! 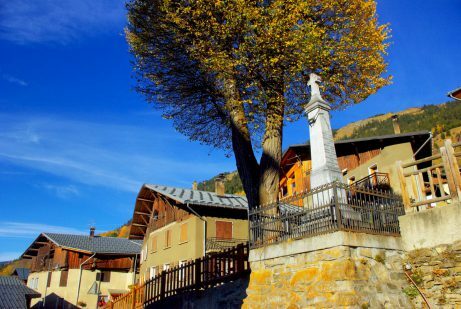 When driving from Moûtiers, you’ll reach first the little town of Aime. This is the last chance to get provisions in supermarkets and grocery stores before heading up to Granier. Aime is located at 700 metres above sea-level. 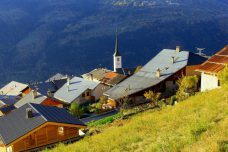 The ascent to Granier takes you to 1,250 m. Fortunately to drive up there is not too difficult. There aren’t as many hairpin bends as to reach La Plagne (5 compared to 22) and the road follows the gentle slope of the mountain. 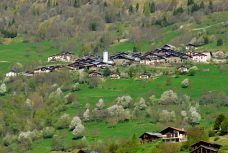 You will cross the villages of Villaroland, Tessens and La Thuile before arriving in Granier-sur-Aime. 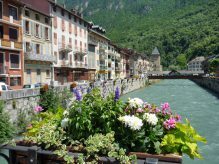 The village occupies a site that looks like a vantage terrace with views into the Tarentaise valley and over to the impressive peaks of the Vanoise massif. 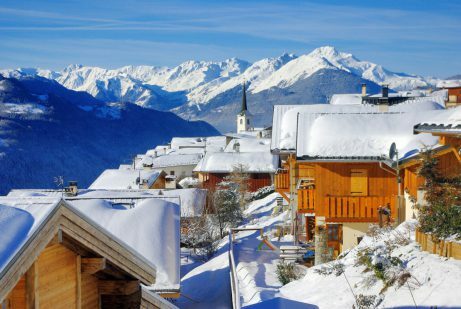 Opposite the village are the ski resorts of Les Arcs, Peisey-Vallandry and La Plagne all situated on the southern slopes of the valley. The villagers calls this favourable exposure the Versant du Soleil (sunny mountain slope) as it is bathed in sunshine all day long. With a population of about 350, Granier is an old village with houses built in wood and stone tightly packed together. The first written mention of the parish church dates back to 1344. 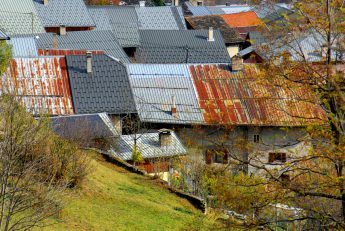 The name of the village may derive from old French Granier or Grenier meaning Attic. 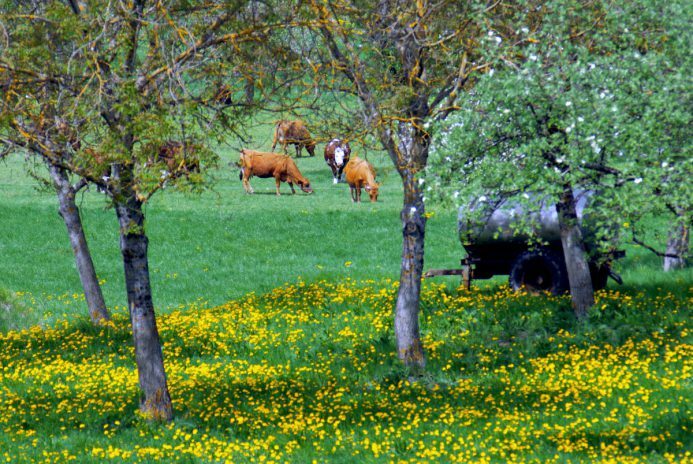 It refers to the barns where fodder was once kept for cows. 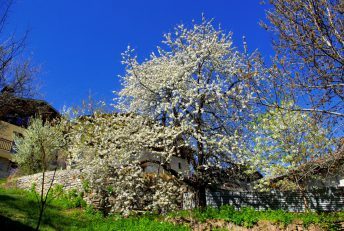 You can still see many very old houses that are typical of that mountainous region. The harvest and fodder were kept just under the rafters in a huge attic room. 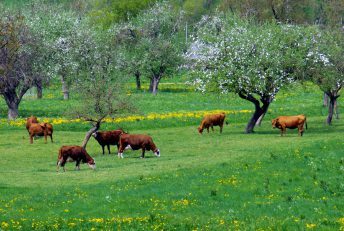 People and cattle lived in the lower floors. 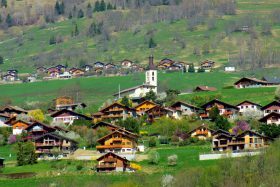 In 2016, Aime, Montgirod and Granier merged into becoming one commune: Aime-la-Plagne. Granier has since become a “commune déléguée” – a delegated municipality. 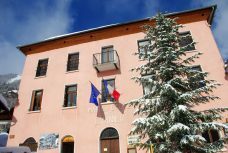 The town-hall (la mairie) is still here, easily recognisable with its pink-coloured façade. It also houses the primary school. The present village church was built in the 16th century on the site of a former sanctuary from the 14th century. 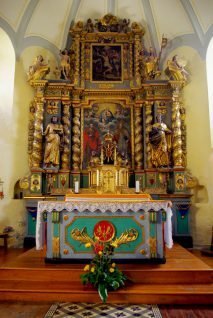 The church is characteristic of Baroque architecture found in the Savoie province. 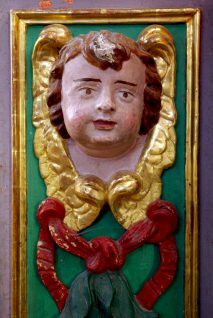 It was first consecrated in 1538 and dedicated to St. Bartholomew (Saint-Barthélémy). The church was enlarged and restored in 1674 and again in 1729. The bell-tower was topped with a spire made by Valsesian master mason Pierre Martinet in 1732 (Valsesia is an alpine region now in Italy). If the church is open, have a peek inside. 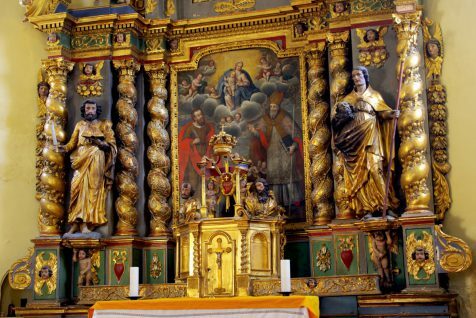 You’ll admire a fine altarpiece of the high altar in Baroque style. 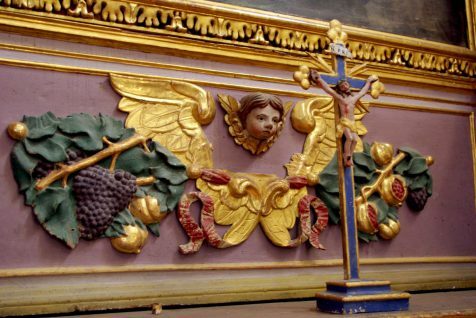 Created in 1677 by Valsesian sculptor Jacques Antoine Todesco, it is characterised by a profusion of ornaments and sculptures finely designed with colours and gold. If you wander around the village, you’ll stumble upon a number of chapels and oratories. Take the Route du Cormet to the direction of the Cormet d’Arêches (that is a mountain pass linking Granier to Arêches). At only 300 metres from the village stands the small chapel of Notre-Dame du Foyer. The sanctuary dates from 1941 and was renovated in 2002. The view from there is one of my favourite. It encompasses the Middle Tarentaise from the Cheval Noir (West, 2,832 m) to the Graian Alps (East) which marks the border with Italy. Just opposite stretches the vast domain of the ski resort of La Plagne, from Les Coches to Aime 2000 and Montalbert. The Mont Pourri, Vanoise‘s second highest peak (3,776 m) majestically dominates the landscape. An orientation table on the site will help you name the major peaks and villages. The next stage is the site of the former ski lift at the site known by locals as Prachanié. The mountain pastures alternate with pine forest. A little higher than the carpark is a narrow path bordering a stream for more than a kilometre. It is known as ‘le sentier du grand Bief‘. In Winter, the site of Prachanié hosts a sledge run and is also the starting point for many cross-skiing tracks. Our friend Valérie who is employed by the local tourist office, runs the ‘buvette de Prachanié‘ on certain days. The small chalet welcomes the visitors and skiers for coffee, crêpes and other snacks. 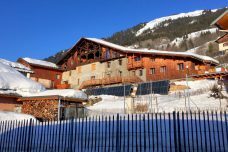 The terrace of the chalet is exposed to sunlight and offer spectacular views over the surrounding mountains. Passed the hamlet of Laval the mountain road climbs up to Plan Pichu, passed a beautiful waterfall. This is the land of Tarine cows, marmots and chamois. The road is not paved all the way and you may prefer leaving your car near the chalets of Laval. Near the mountain pass, the refuge of La Coire (2,059 m) marks the limit between the Tarentaise and the Beaufortain. Across the Valley you can see as far as the ski domain of La Plagne and the Grande-Casse, the Vanoise‘s highest peak (3,855m). 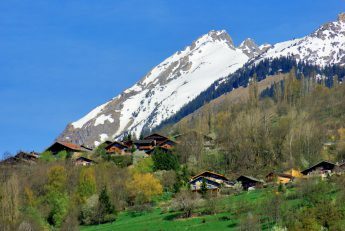 The village of Granier-sur-Aime makes a great base to explore the Middle Tarentaise between Moûtiers and Bourg-Saint-Maurice. 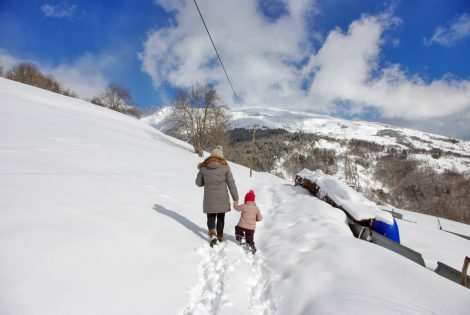 In Winter, the village is close to the ski resorts of La Plagne, Peisey-Vallandry and Les Arcs. It takes 15 minutes to reach Granier from Aime at the bottom of the valley. 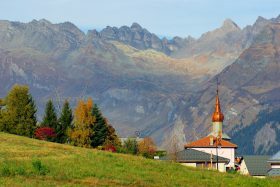 Aime is situated at equal distance between Moûtiers and Bourg-Saint-Maurice (15 kms). The Syndicat d’Initiative (Tourist Office) is located next to the Town-Hall – Website.